The internet is rarely ‘universal’ as it is perceived. With the easy trace of your location based on your IP address, geographical restrictions are easily established by governments. What makes things worse on the internet is the lack of privacy and security, thanks to eavesdroppers and surveillance agencies. Your data on the internet is never ‘private’, they can be easily tapped into and your ISP knows your online data usage better than anyone else. Internet sceptics always tend to worry about their security on the web, and safeguarding one’s own security is the top most priority on the web these days. To move away from all these kinds of limitations that are imposed upon you, you would need something more powerful. A tool that will let you become invincible on the internet, at the click of a button! A Virtual Private Network, or commonly referred as VPN, is the most widely used tool to tunnel internet traffic. What this network does is that it routes your internet connection to its own servers before passing them on to the requested server. The routing involves encryption technologies that make it difficult for an eavesdropper to trace back to the origin of a specific piece of data on VPN. Using these VPN services would make you completely invincible on the web. For getting started with VPN, you would need a powerful service provider with simple setup, fast VPN and reliable support. 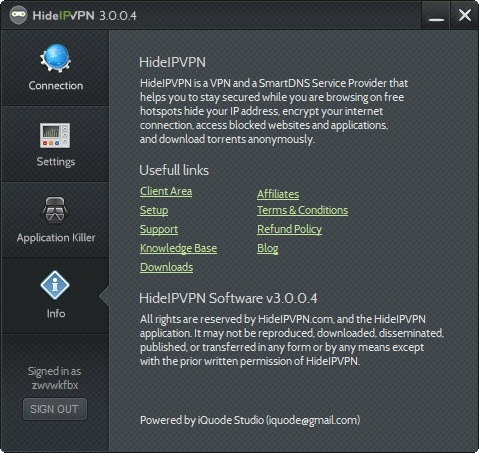 HideIPVPN is a premium VPN service provider with their own dedicated connection wizard for Windows and Mac OS X platforms. Here we will be taking a deeper look into HideIPVPN, one of the most popular VPN service providers. 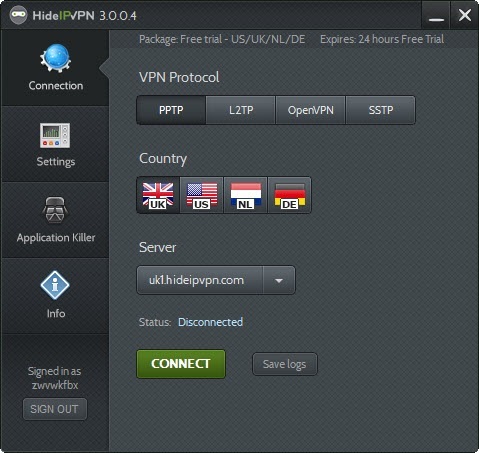 The setting up of a VPN connection couldn’t get any simpler than with HideIPVPN. This tool makes it a walk in the park for even the novice internet user, to setup a VPN connection. Its one-click VPN connection makes things pretty straightforward. To use their services, you will have to subscribe to one of their VPN premium plans or choose the free plan that is only valid for 24 hours, to try things out. The dedicated tool is available for both Mac OS X and Windows platforms, coming in as a 2.5MB download from their official website. Once done with the installation, login with your credentials to get started. At the home screen, all you would be required to do is choose a VPN encryption protocol (L2TP, PPTP, SSTP and OpenVPN), the location of the VPN server and you are good to go. Choose your own VPN server from the dropdown and hit ‘Connect’. This is all you are required to do for setting up a VPN server! 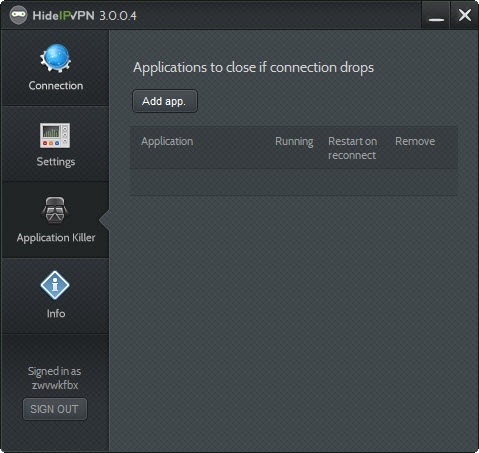 HideIPVPN features an application killer, which can be accessed from the sidebar. This prevents a user from accidentally accessing the web after the VPN connection getting lost due to unforeseen circumstances. Add the list of applications that you access on VPN here to automatically close them in the event of a VPN server disconnection. HideIPVPN states that its premium plans offer unlimited and unmetered bandwidth. So now you can get maximum speed off your VPN connection. Its premium plans come bundled with free SmartDNS service. Make most of this service by subscribing to one of the HideIPVPN’s premium plans. 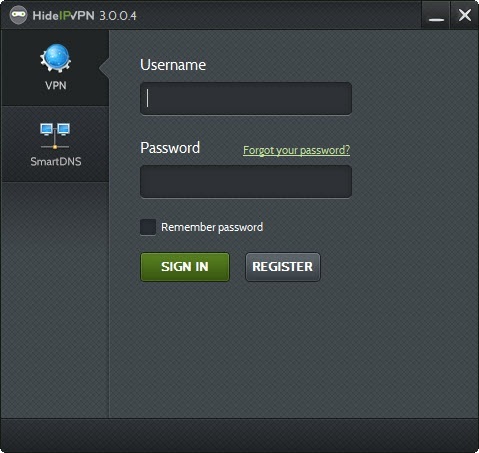 HideIPVPN registers and stores connection logs for only 3 days, which are required for troubleshooting purposes. These logs get automatically dissolved after the 3 days providing you complete privacy and security on the internet. Thanks to government and regional laws, many websites are not accessible in other parts of the world due to their impositions. Get rid of all of those impositions by using HideIPVPN to unlock geo-restricted websites like Hulu, Netflix, Sky Go and so forth. HideIPVPN is one of the cheapest VPN service providers with their competitive pricing. Users can choose between different locations for their VPN server and the pricing varies accordingly. The pricing for the single server – US or UK is $5.99 per month. For an all-inclusive US/UK/DE/NL server, it is priced at $9.99 per month. For torrent downloading purposes, the Germany and Netherlands servers are recommended, as they are not allowed on US/UK VPN servers. This entire place HideIPVPN in a better position compared to its competitors. With support for multiple devices and accessing of their services by three devices simultaneously from a single account make it even more viable. Mobile VPN is also highly demanded these days and HideIPVPN offers support for both the Android and iOS operating systems. Now connect to your VPN server and in a click, enjoy your online invincibility.